With the calendar not really in their favor, left-handers Jason Lane and Scott Rice may not get another major league opportunity--although that is far from certain--but they are a pair of Atlantic League alums still doing a yeoman's job one step below the majors in the Pacific Coast League. 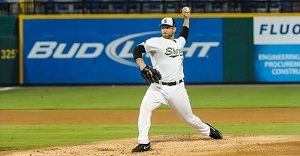 Lane, who is 38, worked for both Sugar Land and Southern Maryland in his quest to convert from the outfield, where he has lots of major league experience, to a fulltime pitcher in The Show. Rice, 33, spent 14 years in the minors, including stints with York, Long Island and Newark in the Atlantic League, before getting his first major league opportunity with the New York Mets in 2013. He worked in 73 games that season. Lane, still a starter for San Diego's top farm club in El Paso, has made 21 starts--one below the league leaders--in the PCL, ranks third in innings pitched (127) and has won eight of his 15 decisions. Rice is a lefty specialist for the Mets' club in Las Vegas, tying for fourth in mound appearances with 44 and compiling a 2-1 record with a save and a 2.05 ERA. He has struck out 31 in 30.2 innings.